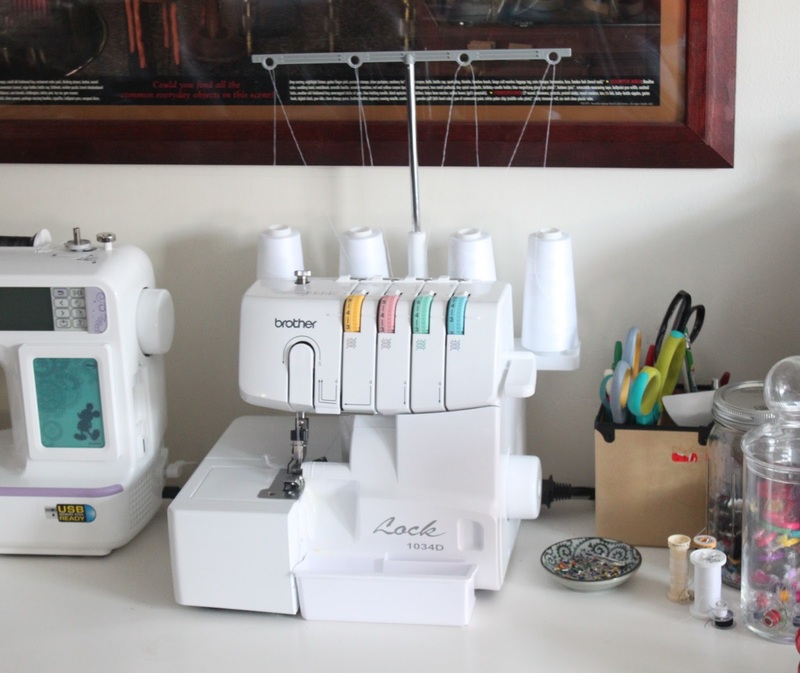 EAT+SLEEP+MAKE: What is a Serger and Why Should I Use One? There are only 2 days left to enter the giveaway to win your own Brother 1034D serger (go enter!! ), so I thought I'd give everyone a closer look at one since it happens to be the very serger my wonderful husband bought me for Christmas this year. First, I want to give you a little back story because I never knew how wonderful sergers could really make my sewing experience. I have been sewing for over 5 years without a serger. 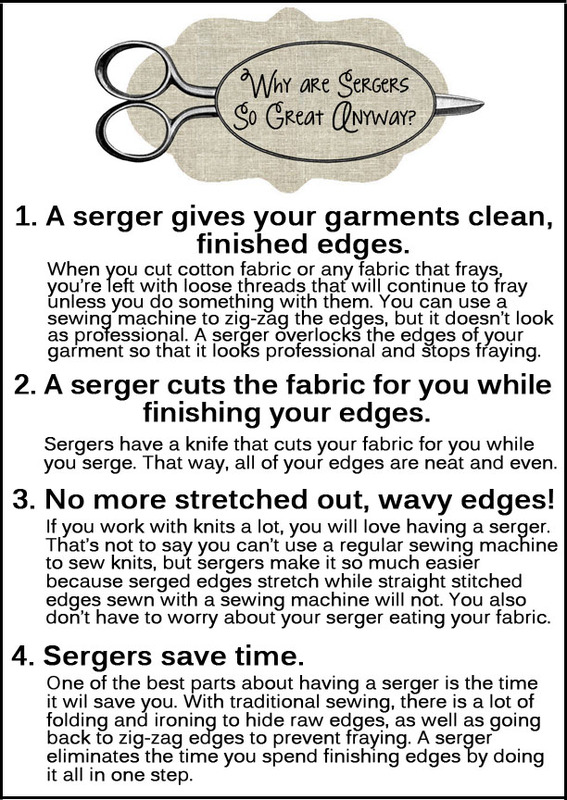 If you're like me, you've probably heard other sewers go on and on about how wonderful sergers are and how much easier they make sewing. Me? I'm a bit of a cheap-o. Usually I like to make do with what I have or buy things on sale if I can, so the idea of buying a serger when I could simply use my sewing machine to zig-zag stitch my seams was not very appealing. Over the past couple of years however, I've been sewing more with knits and getting increasingly frustrated with stretched out, wavy hems and the way my sewing machine ate my fabric almost every time. I knew it was time for a change, so I did a little research. My little Brother 1034D serger has become an essential part of my everyday sewing. Just to be clear, it's not a replacement for a sewing machine, rather it's a supplement that saves a ton of time with professional results. Before I got this baby, I was able to sew up a skirt in a little under an hour. The first time I used it, I made 3 skirts in 30 minutes. Needless to say, I love this machine and whoever wins it will too! And PS, wouldn't it be great to have one right before all the holiday gift making begins? So if you haven't entered yet to win your own Brother 1034D serger, go here to enter, or splurge a little and buy yourself an early Christmas gift. You won't regret it. Also, if you have a serger and you just don't know where to start, Palak at Make It Handmade has a fabulous serger series here that is full of helpful information to get you started and help you troubleshoot any issues you may be having. Have always wanted a serger !!!! Oh hey!!! Thanks for the shout out!!! Can you explain the cutting the edges while it sews part? I'm researching sergers, but this ability boggles my mind. Thank you for this post. This gives me the push i need to get out my serger and utilize it for its capabilities. I know our readers will be thankful for this information as well, so thank you!